287 pages | 58 B/W Illus. John Kloke is a biostatistician and assistant scientist at the University of Wisconsin–Madison. He has held faculty positions at the University of Pittsburgh, Bucknell University, and Pomona College. An R user for more than 15 years, he is an author and maintainer of numerous R packages, including Rfit and npsm. He has published papers on nonparametric rank-based estimation, including analysis of cluster correlated data. Joseph W. McKean is a professor of statistics at Western Michigan University. 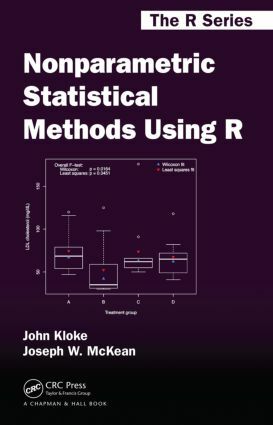 He has published many papers on nonparametric and robust statistical procedures and has co-authored several books, including Robust Nonparametric Statistical Methods and Introduction to Mathematical Statistics. He is an associate editor of several statistics journals and a fellow of the American Statistical Association.